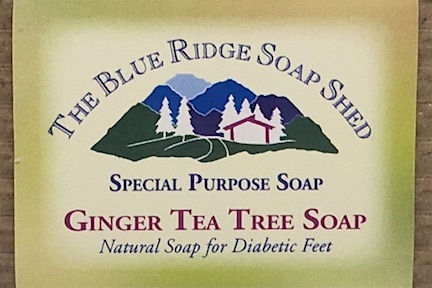 Using our most moisturizing shea butter soap recipe, we formulated a soap to meet the special cleansing and circulatory challenges of diabetic feet, where skin dries out under the toes and is more prone to cracking. We combined Tea Tree Essential Oil because of its reported natural infection-fighting properties, and Ginger Essential Oil because it has been used for centuries in China and is believed to stimulate circulation. If this soap smells too medicinal for you, try Toasted Tootsies, our Lemongrass, Peppermint and Tea Tree Shea Butter Foot Soap, which is an invigorating scent combination for a foot soap, in addition to reducing foot odor caused by smelly feet afflictions and easing that horrible sunburn that roasts the top of your feet (thus, Toasted Tootsies!). Because of our Shea Butter and Cocoa Butter recipe, both of these moisturizing soaps are gentle for sore, dry feet, and hardened heels with cracking skin. A great, soothing foot soap just for the delicate tops of your toasted tootsies, and any other part of your foot that pays the price when you sunbathe or walk on the beach.